With Readly you can read All About History Book Of Vikings and thousands of other magazines on your tablet and smartphone. Get access to all with just one subscription. New releases and back issues – all included. 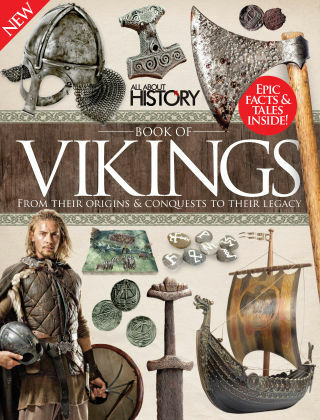 Packed with fascinating facts and images, the All About History Book of Vikings explores what caused the end of the Viking age, what their remaining legacy is, and gives you the chance to gaze upon the historical artefacts that help us understand more about these incredible warriors. Featuring: Viking Raiders - Portrayed as bloodthirsty pirates, pillaging innocent villagers, Vikings also ruled the waves with a lucrative trade network. Exploration - Find out how and why the Vikings spread their wings and discovered new lands far and wide. Everyday life - Vikings had their own beliefs, rituals and social structure, and expressed their artistic side through the likes of pottery and crafts. The Viking legacy - Far from disappearing into the annals of time, the Vikings left a lasting legacy that lives on today.